Home / Tide Clocks / Wooden Tide Clocks / Sea Kayaker Tide clock.Hand painted and customizeable. 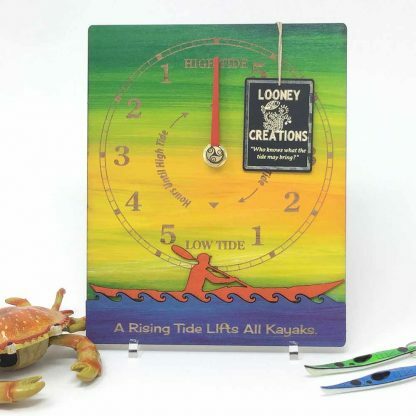 Our hand painted sea kayaker tide clock will make sure that you always know if the tide is high or low,rising or falling. Set it once and it keeps in harmony with the tides so that you never make a mistake with the state of the tide on your local beach or marina, slipway or pier. 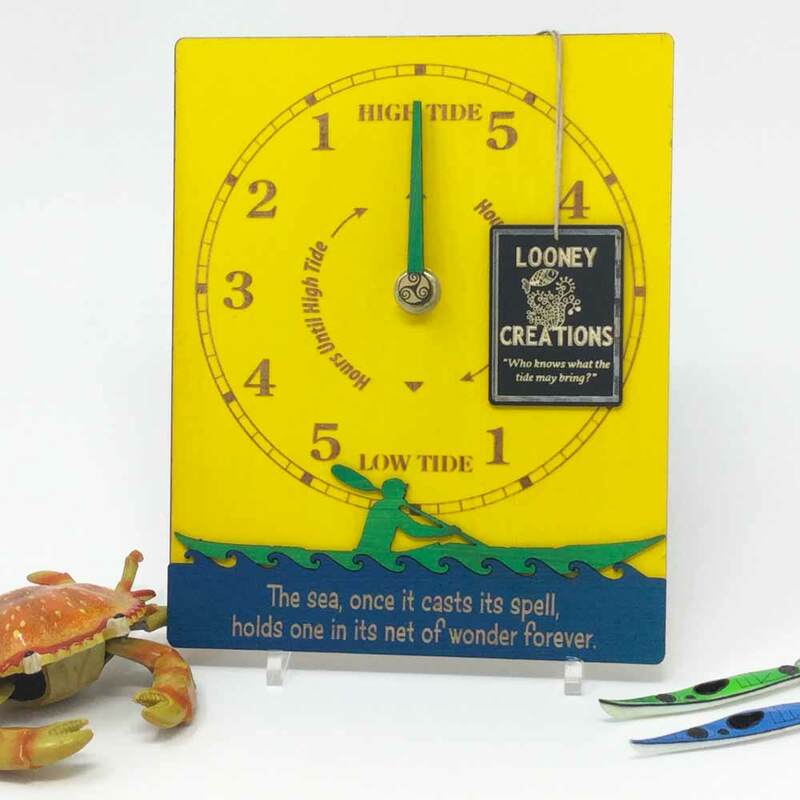 The clocks are available in Natural Wood, Yellow, Sunset and Sea Spray colours and ship with full, simple to follow instructions. Always know the state of the tide at your local spot. 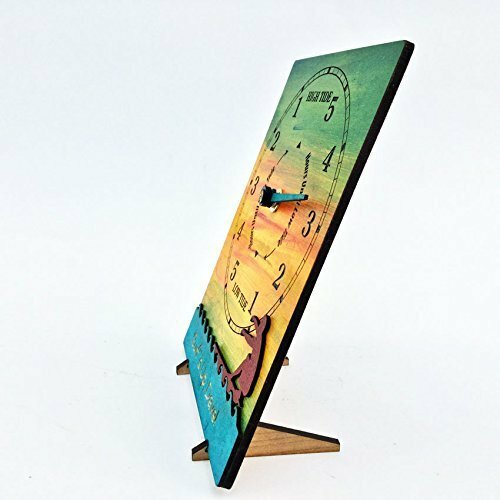 A great gift for sea kayakers, ocean paddlers, canoeists, surfers, SUP afficionados, bodyboarders and anyone who loves to play in the ocean. Our hand painted tide clock will make sure that you always know if the tide is high or low, rising or falling. Set it once and it keeps in harmony with the tides so that you never make a mistake with the state of the tide on your local beach or marina, slipway or pier. 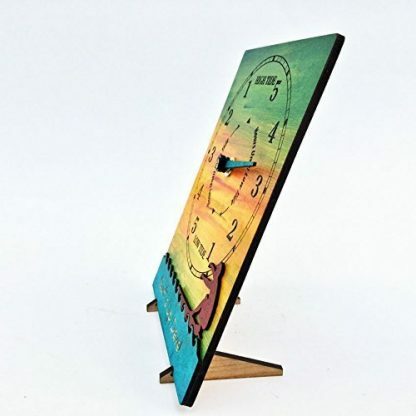 This particular clock is 18cm high and 14.5cm wide-it can either be wall mounted or free standing. 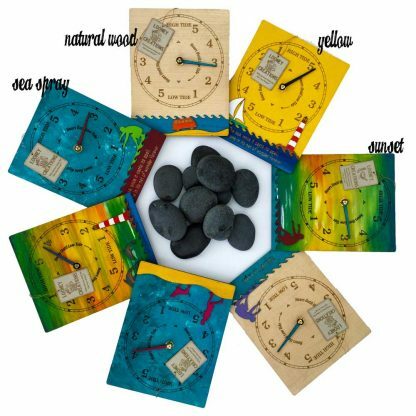 The end result is an item that will look well in any surroundings, whether on a fireplace, a cabinet or on the wall. 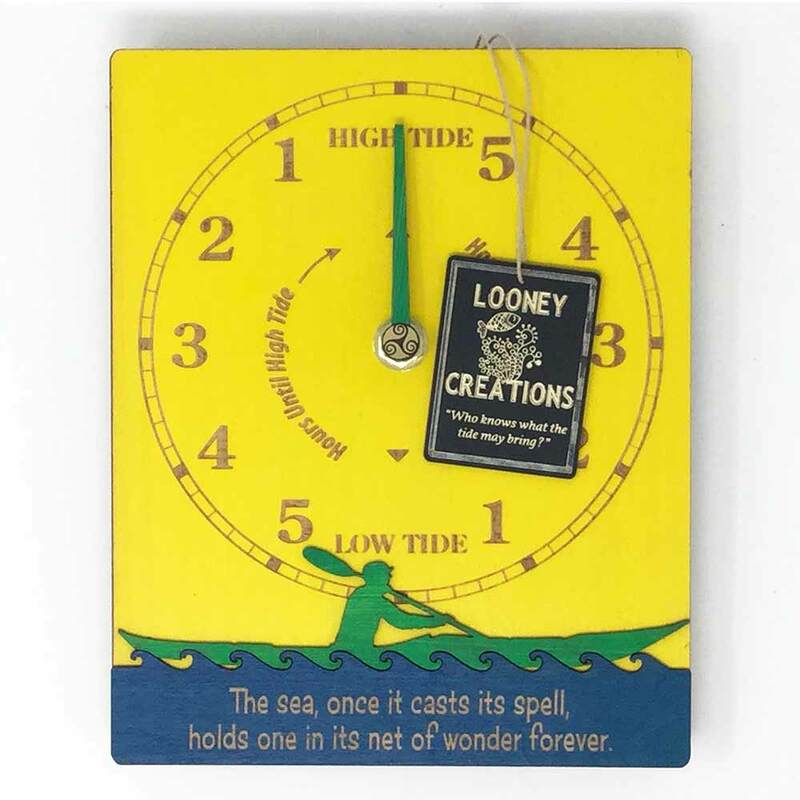 Our handmade tide clocks are ideal tools for sea kayakers, surfers and also for fishermen, sailors, kite surfers, dog walkers, horse riders and anyone that uses the coast for pleasure or profession.They make a treasured house warming gift for coastal residents. Tide clocks are easier to understand than tide tables. They run on moon time and instead of revolving every 24 hours,they revolve every 24 hours and 50 1/2 minutes.Along the Atlantic, where the tidal cycles are regular with two high and two low tides during each day, the clocks rarely need adjusting.They can be used on all Atlantic coasts in Europe and the East coast of the US and Canada. 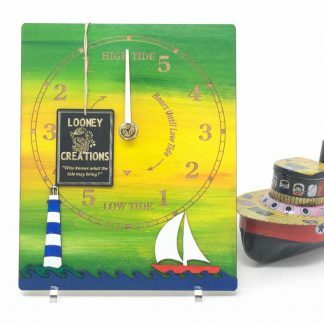 We are happy to customize a clock especially for you.We can change the text on the waves to whatever you would like. For example “Paddling Time, Mark” “With love from Mary” etc….Please contact me and we can work it out! IF NO CUSTOMIZATION IS SELECTED, THE CLOCK WILL HAVE NO TEXT ALONG THE BOTTOM. 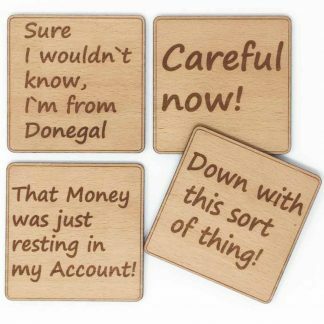 For customised text, please select the “Enter Customised Text If Required” option and type in the text that you require.Max 30 characters..
We will make your order in 2-3 business days. 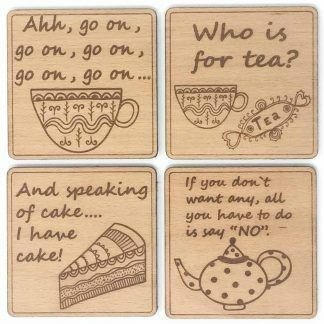 Please note that shipping to the UK will take 3-5 days, countries in Europe will take about 7 days, and the U.S. from 5 to 21 days ( but is usually pretty fast); Australia and other countries – from 7 to 22 days.